One of Okinawa's undiscovered gems is the Coco Garden Resort. The hotel has a special low rate for island residents (not available to overseas visitors) and there is still time to take advantage of it before the offer expires at the end of this month. 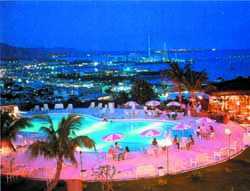 The hotel, overlooking Ishikawa City, is close to Camp Courtney and attracts a lot of foreigners. They seem to like its relaxed atmosphere, its great variety of activities and the cheap prices. The management claims it offers the best quality for comparable services anywhere on Okinawa. The place is huge. Its hideaway cottages are so widely scattered that it has golf buggies to ferry visitors around and it also has a ten minute shuttle bus connection to its sister hotel, the Renaissance where there is fine dining and a spa, which can be used free of charge by Coco Garden guests. There are three types of rooms. The cottage accommodation is a combination of Okinawan and European styles. They are high ceilinged and big enough for whole families. They are surrounded by lots of plants and tropical flowers. A double hammock swings gently in the breeze. The possibilities for weekend or even week long escapes are obvious enough here. Some visitors from the Kadena air base have been known to stay as long as ten days. The second style of room has balconies overlooking tennis courts and the sea on the Pacific side of the island. They have names like Hong Kong, Peking, Bali and Phuket and are big enough to use for private parties. They have, large dining tables, karaoke machines and cost ¥4,500 to rent for two hours, including the cost of food and crooning. There is also another more standard type of karaoke room with a low table and sofas lining the walls which can be used for parties with buffet snack style food. The third type has twin beds and overlooks the hotel pool which is kidney shaped and has a stunning view of the ocean. Beside this pool is a craft shop which has many types of different shells on sale for between ¥100 and ¥300 which can be made into necklaces or sewn onto chokers straps and anklets. This can be done on the spot or the shells can be taken home. Other craft possibilities to while away those poolside hours are painting ceramics. Coco Garden Resort has an impressive restaurant, Makan Makan, ("Eat, Eat!" in Malay) Lunch here is a modest ¥1,600. The evening buffet, at ¥3500, serves Chinese Dim Sum steamed delicacies in bamboo bowls, wheeled round on trolleys and selected by diners, who can eat as much as they like. This is high quality dining and anyone who likes it enough to want to come back many times more can buy a book of tickets which gives them one free lunch. They cost ¥35,000 and allow 11 lunches. Near Makan Makan is a cozy, irregular shaped bar with wicker furniture and broad, red topped stools. It has a spectacular picture window view of the bay. Room rates for the Coco Garden Resort are ¥4,500 per person for a four person room, ¥5,500 for a three person room and ¥6,500 for a two person room. There is a relaxed checkout time of 2 pm.